Bordeaux is a beautiful city; indeed Victor Hugo found the city so beautiful he once said: "take Versailles, add Antwerp, and you have Bordeaux". 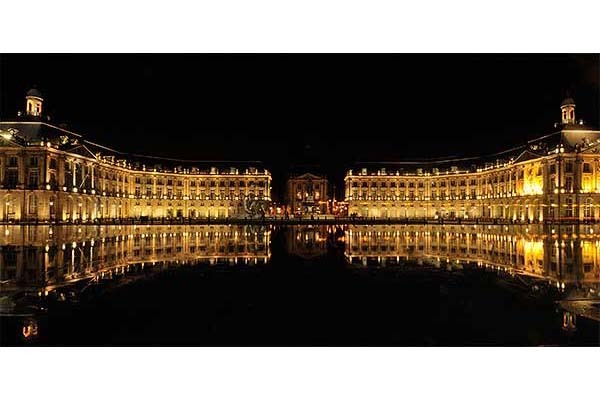 Not for nothing has Bordeaux's city centre been declared a UNESCO World Heritage Site. In 1849, when Emperor Napoleon III wanted to transform a then still quasi-medieval Paris into a modern capital that would make France proud, he declared that Bordeaux's wonderful mid-18thC buildings, open squares and wide boulevards should be used as the model. The architecture of Paris is therefore based on the architecture of Bordeaux and not the other way round, as is commonly believed. Situated astride the mouth of the Garonne river, Bordeaux was once a thriving port with deep water access to the Atlantic ocean*. Whilst cruise ships still dock on a regular basis in the summer, the old commercial shipping quays in the city centre have been comprehensively refurbished to create a fabulous promenade which includes a park and the amazing 'Miroir d'Eau' ('water-mirror' in English). 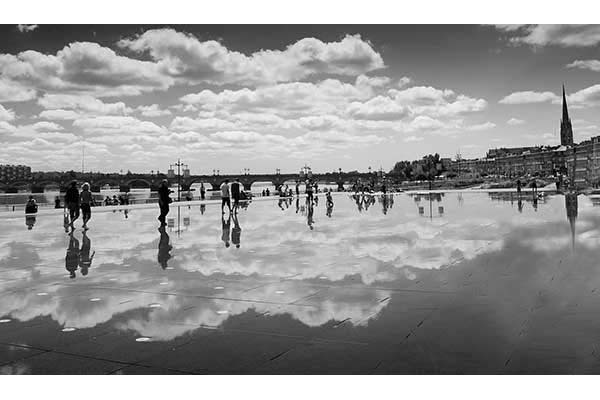 When static, the Miroir d'Eau reflects all and everyone around it. 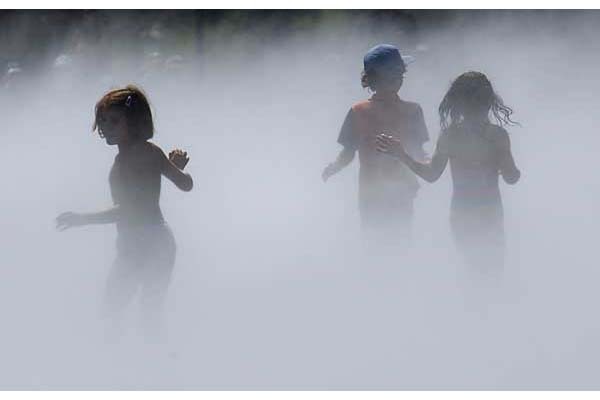 Then, every twenty minutes, a myriad hidden jets emit a fine spray from the feature and hundreds of people walk barefoot through the cool mist, just because it's such fun - like walking in the clouds! The photos above show the Miroir d'Eau in its mirror phase, its spray phase and its fill phase. As you can see, the Miroir d'Eau is a great photo opportunity! And, for those who like street photography (and also for those who like to do a bit of shopping! ), the fabulous rue Sainte-Catherine is a must. La rue Sainte-Catherine is the longest pedestrianised shopping street in Europe. Stretching 1.25 kms from la Place de la Victoire at one end to la Place de la Comédie at the other, la rue Sainte-Catherine has more than two hundred and fifty shops! Incidentally, it isn't always this hectic, the photo on the left was taken at the peak of the busy August holiday season! Despite its ancient history and stunning 18th century architecture, Bordeaux is not stuck in the past. In fact it's a perfect advertisement for the modern France - a fast-growing, lively city, and a popular choice for many young French people who go there to study at one of its leading cultural and higher-educational establishments. In addition to its highly respected university, Bordeaux is a recognised centre for medical, veterinary, architectural and musical study in France. 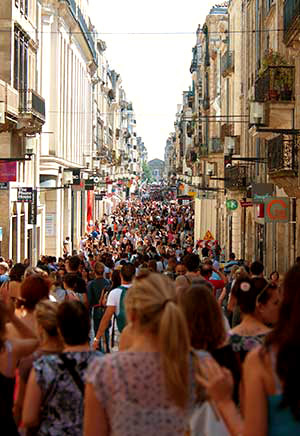 Bordeaux is also one of the two major French fashion centres. Here you'll see French 'chic' to rival Paris! 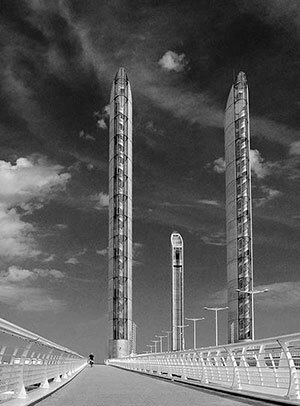 Le Pont Jacques Chabon-Delmas was completed in the spring of 2013. The bridge is the largest lift bridge in Europe, and presents a great photo opportunity! We've made this trip optional because of the extra costs involved (20 litres extra fuel, autoroute tolls, city centre car parking etc) and also because it may not be to everyone's taste. Obviously, however, all guests on a given holiday week must be in agreement to go - we can't take some and leave others at home! 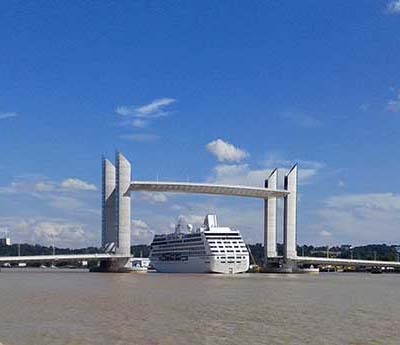 * Because of its location on the river Garonne, miles from the coast, yet with easy access into the Gironde estuary and thence to the Atlantic ocean, Bordeaux was an important submarine base for the German navy during World War II. 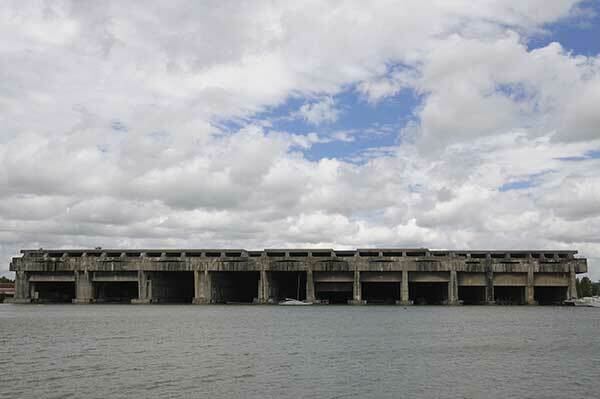 The U-Boat pens were built to such a high standard of protection against destruction by the allies that they are impossible to dismantle and so are still there!